Thisour new glass square table is perfect for your outdoor space which cansurprisingly highlights your patio or poolside deco. Made of tempered glass andgray powder steel, our product aims to bring you a premium satisfaction ofrelaxation and romantic. The design of rear leg connector and dual-supportholder make this table more sturdy and stable .You can enjoy a cup of tea atthe swimming pool side or in the courtyard. This glass square table can also bea fine decoration of your home. Don't hesitate! Come and buy one! Stylish Appearance: Featuring neutral color, it equips with a tempered glass top and gray powder steel pipe, which make it more eye-catching. Its compact structure and beautiful texture can surprisingly highlight your backyard deco. Moment to Clean: Its smooth surface makes your cleaning more easier. The stains left on the table can be quickly wiped, which also reduces your annoyance accordingly. Water-waver design not only offers a neat and clean presentation, but ensures you a safe use when the glass breaks into pieces. Weather Resistant: Its premium performance can be seen at its good tolerant of high temperature and its wide application for outdoor use fulfills your purpose to decorate the place you desire. 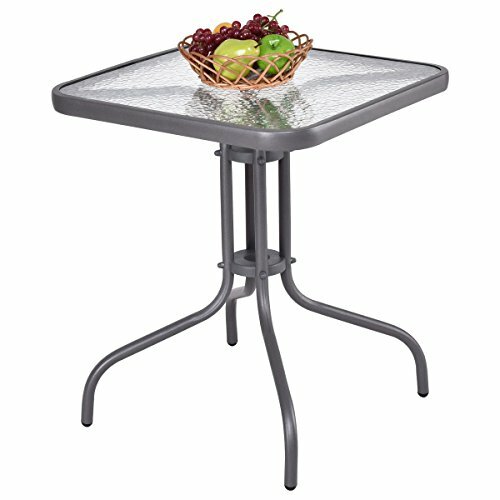 Our patio square table is durable enough to withstand rain and wind for year-round use. Stocky-Leg Design: Stocky legs with powder steel pipe guarantee the table steady preventing it leaning or inclining. Four separate legs bring you a reliable using experience for its stability. The new dual-support design makes it more solid.